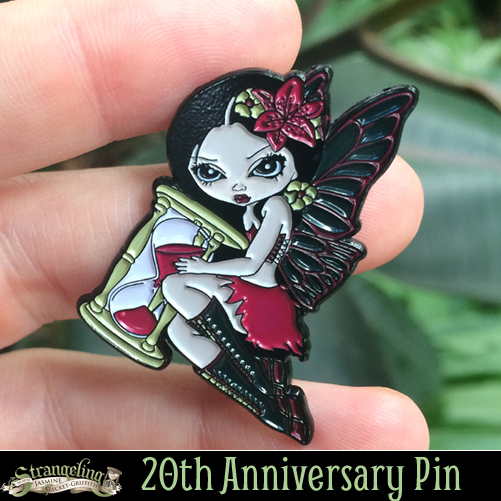 Firstly - we still have some of the free 20th Anniversary pins for the Strangeling.com giveaway! We've already given out nearly half of them, so the sooner you can get an order in - the better (they will probably not last for the full month unfortunately, they are going fast!). We are including a free "Time Flies" pin in each order over $25 placed at Strangeling.com for the month of July (or while supplies last, I made about 200 of the pins). Next up - we are currently on our West Coast summer tour! TONIGHT I will be in Seattle for my appearance at the Insectarium group show at Eight and Sand Gallery (part of Georgetown's Art Atttack art walk) - details are here - I'll be there from 6-9pm tonight (Saturday) in person, details are here. I have new original paintings (four full sized, two Tiny Treasures), prints and canvases there and I'm happy to autograph anything from the show or what you bring with you from home. July 13, 14 & 15th I will be in Anaheim, California for Disney's D23 Expo, debuting my new "Princess Aurora" painting for Disney! Details about the specific signing/autograph events & painting debut are here. We return July 17 from the west coast, so in the meantime if you place an order for an original painting or for a limited edition hand embellished canvas in the next week or two we will have a short delay (as I have to wait until I'm back in my studio to ship those personally!) - everything else though (prints, pins, books, etc.) will be shipping as always with no delay. Next - I have a new painting to show you! The piece I did for the Three Wishes Faery Festival is now available as prints & canvases (the original painting has been SOLD). You can order those here at Strangeling.com (and remember, if you order more than $25 you'll get the FREE Time Flies anniversary pin!). 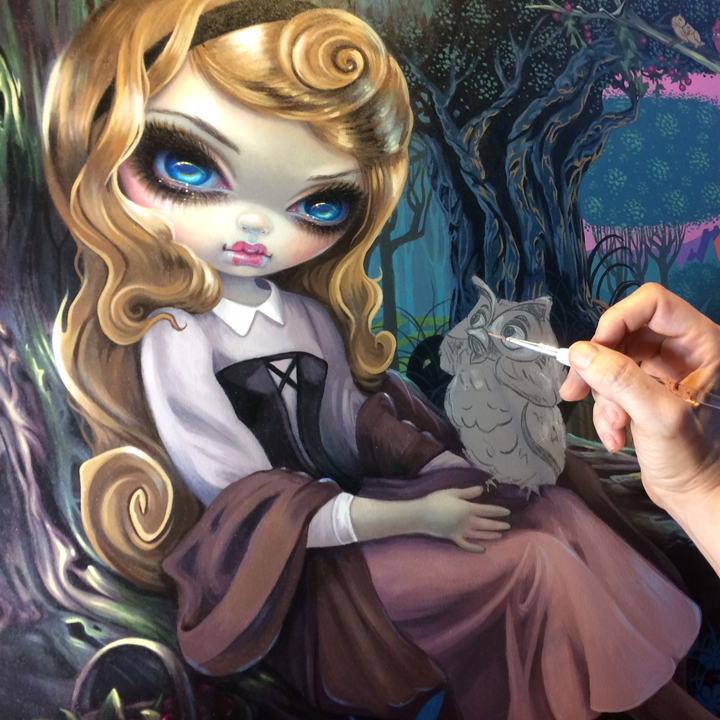 Speaking of original paintings, I have been working on several new ones for upcoming gallery shows and for DragonCon! Check out my Instagram (ID: Strangeling) or Facebook here to see these works-in-progress. Another new project I'm happy to announce is my PERPETUAL CALENDAR - an enormous project consisting of a perpetual calendar with 60+ tiles (including special event tiles for birthdays, seasons, etc. with my paintings on them) and 12 handpainted figurines - all on a specially-built calendar shelf. Perpetual calendars can be used year after year, as you arrange the days of the week, holidays & date yourself with the tiles - super neat. It is in the pre-order stage so it is currently first available to USA customers at the Bradford Exchange - you can order here. Live outside the US? Don't worry, after the release it will pop up at the international shipping site Burning Desires here later this year after the release for worldwide shipping anywhere on the globe. And finally - ACEOs! I have a bunch of new ACEO cards up for auction on eBay, each starting at literally one penny, each one will be popping up a different day this week while I'm out of town click here to see them all...... I will be back home in time to ship these out with no delay. Prints now available from $13.99 here - we ship WORLDWIDE. 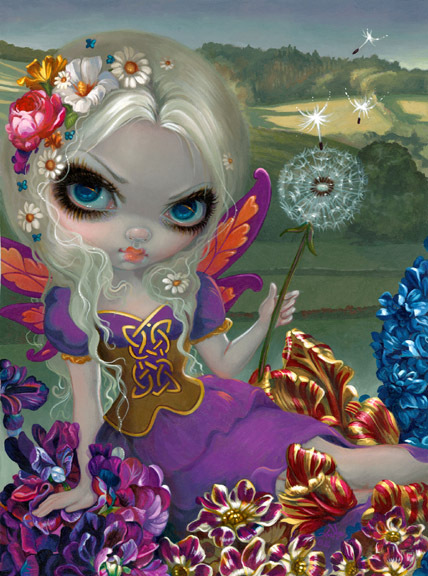 A special painting I created for the UK event - "Three Wishes Faery Festival" I attended a couple weeks back in Cornwall! The original painting sold, but we have many types of prints - 8x10" and 12x16" glossy photo paper prints on sale for $13.99 and $29.99 each - signed by me on the back, and we also have limited edition canvas prints (11"x14", wrapped on boards & ready to hang, hand embellished by me in acrylic paints, signed & numbered out of only 25 made) for $125. Another new project I'm happy to announce is my PERPETUAL CALENDAR - an enormous project consisting of a perpetual calendar with 60+ tiles (including special event tiles for birthdays, seasons, etc. with my paintings on them) and 12 handpainted figurines - all on a specially-built calendar shelf. 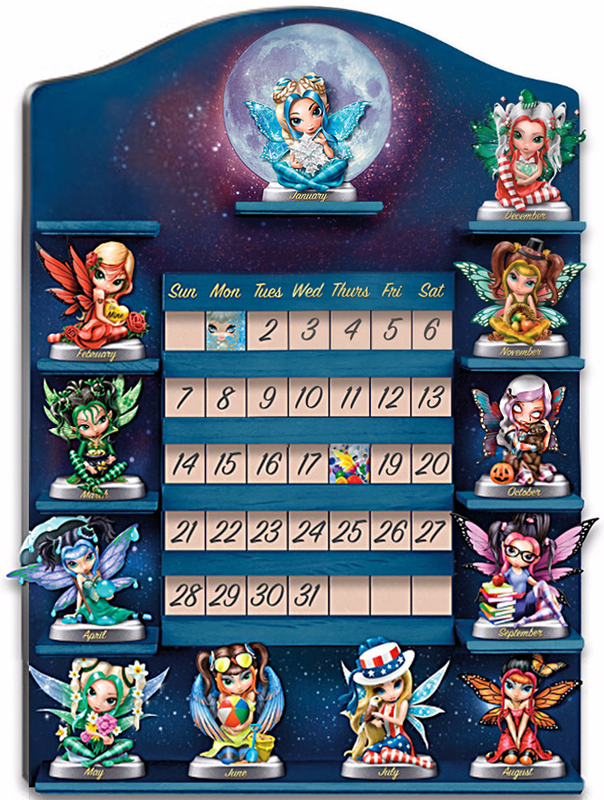 I'm very happy especially since this project "resurrected" many of the holiday figurine designs that we previously tested but hadn't made it into production yet - such as my Zombie Fairy (she's the October figurine!) and my Fourth of July fairy, etc. Yay! Perpetual calendars can be used year after year, as you arrange the days of the week, holidays & date yourself with the tiles - super neat. It is in the pre-order stage so it is currently first available to USA customers at the Bradford Exchange - you can order here. Live outside the US? Don't worry, after the release it will pop up at the international shipping site Burning Desires here later this year after the release for worldwide shipping anywhere on the globe. Yes, it's July 2017 which means that it is the 20th Anniversary of Strangeling.com! Can you believe it? Twenty years! In celebration of this I have created a new collectible enamel pin called "Time Flies" (it sure does!) that we are GIVING AWAY to you guys as an anniversary gift! Not for sale, exclusive to Strangeling.com = we are including a free "Time Flies" pin in each order over $25 placed at Strangeling.com for the month of July (or while supplies last, I made about 200 of the pins). All you need to do is place an order for anything up at Strangeling.com between now and the end of July and we will pop one into your package before it ships! Click here to start shopping! *It won't show up really in the shopping cart or anything, it will just manually be added by my sister Amber & my husband Matt when they are packaging up orders for the month of July. So don't worry that it doesn't show it in the shopping cart, we will automatically be adding them when the order is being processed. *If you order something that is back-ordered (I think most things are in stock now, but in case) we will set aside your pin for you for when your item comes back in stock. You won't miss out! *You can't buy a $25 gift certificate, it has to be physical merchandise. However, if you already HAVE a gift certificate and use it to buy $25+ worth of stuff, you WILL get a free pin! *If you are a Patreon $10+ member you can use your PATREON10 discount code to get your usual 10% off as always, but your total before shipping will have to hit the $25+ mark before checkout to receive the free pin. *Yes, you can buy other pins in order to get the free pin - or prints, or original paintings, canvases, books, colouring books, journals, anything really - any actual order that totals $25+ worth of actual merchandise. Soon after D23 we will have the Princess Aurora prints & merchandise at the various other Disneyland & Disney World (CA and FL) locations, including my August 19 even at Disney Springs' Marketplace Co-Op in Florida. If you can't come to D23 - don't worry California folks - I will be returning to Disneyland's WonderGround Gallery at Downtown Disney on October 27-29th for a THREE DAY Take Over event - yay!! For every original painting I do, I create one single ACEO card. ACEO = Art Cards, Editions & Originals. 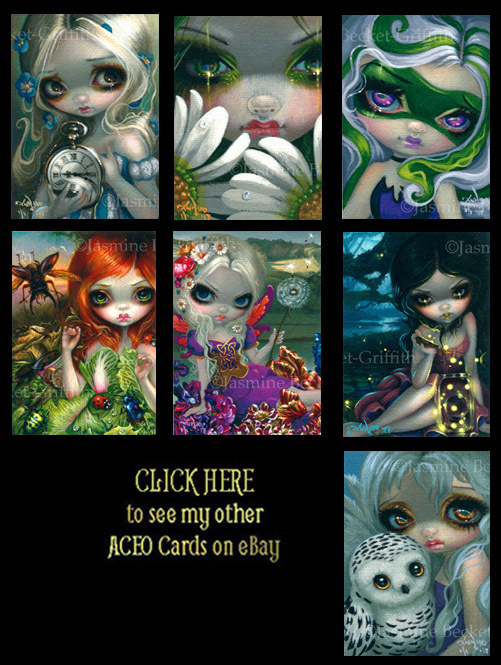 ACEOs are standardized 2.5x3.5" trading card sized pieces of artwork. With mine, each is a tiny canvas giclee - I then go in with my acrylic paints & brushes painting fine details & embellishments, signing, dating & numbering out of only ONE (they are each numbered #1 of 1 because I only ever make one!). I even do this with my rare paintings, mini paintings, etc. so often this is literally the only way to purchase that specific piece as a giclee. Since they are so special and only one of a kind, to be fair to everybody I always auction them off, with bidding starting at a penny, so that everybody all over the world in any time zone has a whole week to peruse them and enter their bids. I have several up now (and will be listing some more later this week) - click here to see them all!